They're on ebay at the moment. Auction ends in an hour and a half. Here is the link. Last edited by Austin-Fitz; 07-31-2018 at 08:07 PM. Thanks for the heads up, I got them! Awesome! Glad someone here got them! I was hoping to have a spare set for my late '70s Jupiter, but I wasn't sure if they would fit. Good thing I decided to ask here before bidding. Since they wouldn't have worked out I figured I'd buy something else for my kit instead. As I've said before, I'd like to add a few more cymbals and stands to this kit. Originally it would have come with two 903D straight stands. One of which was still with the kit when I found it, and I really like it! I also like things to match, and I like heavy duty stands, so I decided I'd try to find another 903D straight stand or two, and maybe a couple of boom stands from the same series as well. 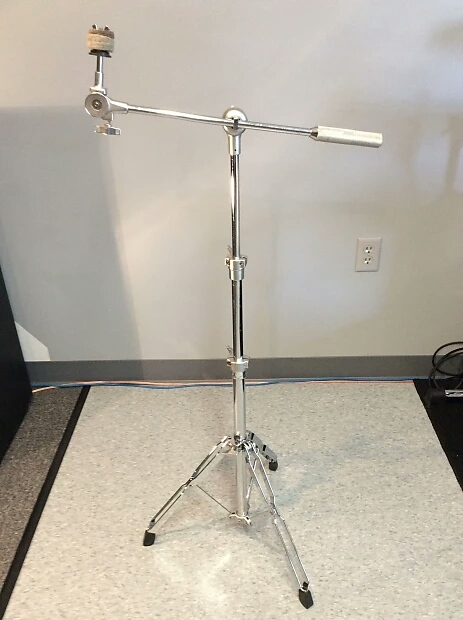 Haven't come across any of the straight stands yet, but I did snag this 903BST boom stand off of Reverb. I haven't received it yet obviously, but it looks to be in great shape! I know it's going to weigh a ton lol. My 903D probably weighs 10 or 15 lbs. No ultra lightweight hardware here! I think it will be really cool to have all of the period correct matching hardware for this kit. I dig the sandblast finished bits on them. Matches my tom arms and memory locks! I appreciate the heads-up on the snares. I made one from a Puresound snare that is the same length, and it works great. I will probably just hold on to these originals to have. My wife says I'm a hoarder. 4 months later and I'm still giddy about this kit lol! I've mostly been playing around with tuning lately, and I'm happy to report that for the first time in my life I've managed to get a killer bass drum sound with no muffling. I've always hated having stuff in my kick, but never had one that I could get to sound good wide open, and usually ended up using a pillow. This 14x24 nails it though! It's the perfect balance of attack and boom with a beautiful tone! I'm happy to report that for the first time in my life I've managed to get a killer bass drum sound with no muffling. I've always hated having stuff in my kick, but never had one that I could get to sound good wide open, and usually ended up using a pillow. This 14x24 nails it though! It's the perfect balance of attack and boom with a beautiful tone! Forgot to post an update here, but I recently took my Jupiter snare apart to deep clean everything before putting new heads on top and bottom. It came out great!!! It now has a Remo Coated Ambassador on top, and a Remo Ambassador Hazy Snare Side on the bottom. Still using the original dual 10 strand wires. Here's a pic of the finished product. Sounds just as good as it looks too! Thanks! I couldn't be happier with it. Also I just wanted to note that I've checked out the lug springs on all of the drums as you suggested, and they are all packed with foam seemingly from the factory. I thought that was a nice touch. Everything feels very high quality, and after playing them regularly for a full year now I've not had any issues with anything! I'm still madly in love with them lol.